The list below includes the names of the commercial motion picture theatres equipped for 70-millimeter (5-perf wide gauge) film presentation in the San Francisco, California, USA region (the "Bay Area"). What follows the theatre list is a year-by-year summary of the films exhibited in 70mm format in those theatres. Note that the list of theatres is not a listing of venues currently in operation that have 70mm presentation capability. Instead, this is a historical list which documents those theatres with 70mm capability at one time or another from the introduction of Todd-AO in 1955 to the present. Many of the theatres listed are closed or have been demolished. 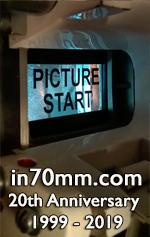 Many, however, are currently in operation and may still have 70mm projection capability. The theatres have been identified sans owner/chain/circuit, and are arranged alphabetically based on city, community or recognized place. The owners, however, have been identified in the film list based on the time of the engagement. There were no new first-run 70mm releases in 1957 (though "Around The World In Eighty Days," which opened in December 1956, played at the Coronet throughout the year). Engagement included "The March Of Todd-AO"
Engagement included "The Miracle Of Todd-AO"
Engagement began as the "MGM Fabulous Three"
*Double feature with "Close Encounters Of The Third Kind"
Includes 70mm Sneak Preview on May 19 "(Coronet)"
Coate, Michael and William Kallay. "Presented In 70mm," Widescreen Review Presents The Ultimate Widescreen DVD Movie Guide. Volume 1, Number 1, 2001. "Dolby Stereo Equipped Theatres." Dolby Laboratories, Inc. Selected Issues 1977 -1987. Hauerslev, Thomas, Ed. "DP70s In The US." Hayes, R. Michael. "Roadshow Movies: A Review Of Disc Versions Of Hard Ticket Features." Widescreen Review Presents Laser Magic 1998. 1998. Norwood, Scott, Ed. "US 70mm Capable Theatre Listing." Any inaccuracies or inconsistencies in the source material may have been carried over into this work, and the authors/compilers accept no responsibility for such errors.